The first time I fished a muddler minnow I was paddling across Lake Pearson one evening. I was heading over to the raupo at the northern end of the lake. I had a muddler tied on and decided to let out some line. Oh, by the way, I was in a float tube with flippers strapped to my wader boots. This is a great invention allowing you to fish those areas you wouldn’t otherwise be able to reach. So here I am letting out some line and paddling my way across the lake. The line was sinking but the fly was still floating. I have since learnt that if you soak your muddler in a glass of dish-washing liquid and water, it removes the oil from the hair and it will sink. Above: Start by winding a base of lead wire to two thirds the way up the hook. Take your thread and bind over the lead to make it secure. Pull core from Mylar tubing and slip over lead core. Tie at each end. I had just passed over a weed bed and a short time later felt the fly pull through the weed, then whack! A very chunky brown of three pounds was played to the tube. It’s a very interesting sight to see fish swimming around your feet. I have even had a fish go under and out the other side. Well it was fish landed as I continued on my way to the raupo because my fishing mate was walking around to the spot. During the night I caught another fish much to the amazement of two anglers who were fishing from a boat, and probably thought I was standing in 10 to 15 feet of water. 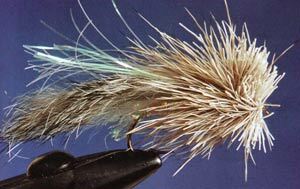 Over the winter after that season, I saw an American video on tying western trout flies and one such pattern was a Kiwi Muddler. 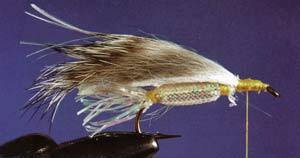 It was a variation of the original created by tying a wing of rabbit strip instead of turkey feather, rabbit fur having a more lifelike action as it is pulled through the water. Above Step 2: Tie pre-cut strip of rabbit skin in place. It helps the action in the water if a slight taper is cut at the tail end of the strip. The next season came around and with it stories of big trout in the Ellesmere system. I thought this would be a good opportunity to try the Rabbit Muddler as in the past it has been very hard to get a pattern bulky enough. The most successful fly being a Mrs Simpson with a wing of squirrel tail to bulk up the shape. So I went off to the Halswell River at Green Park Huts where a small creek comes to the opposite bank. I waited until dark and began casting across and into the stream on the other side. With the wind at my back I was able to get quite a good cast. Suddenly the line stopped dead. “Blast a snag,” I thought. But no it was moving. A careful lift of the rod tip and all hell broke loose. Just as suddenly; it was gone! I thought he had broken me off! But no it was even worse. I hadn’t taken enough time when tying the fly and had used a cheap hook that had snapped at the bend. So don’t skimp on those hooks. Above Step 3: Add strands of Flashabou. Take a clump of deer hair and tie in place. As you tighten the thread the hair will flair out. Tie in half a dozen smalt lots of deer hair rather than one big one. For this pattern you need hook sizes between 2 and 6. Also needed are some: Mylar tubing, lead wire, rabbit strip (which comes in a range of colours so that you can tie to your needs – dark for bulky patterns and greys for smelt and sea trout patterns plus bright coloured rabbit strip for maybe salmon lures), a few strands of Flashabou or Krystal Flash for added attractant, and finally deer hair for the head. Start winding a base of lead wire to two thirds of the way up the shank of the hook, take your thread and bind over the lead to hold it in place. Now take your Mylar tubing and pull out the cotton core, pull tube over the lead and bind down at the tail leaving about 4mm free so that the rabbit strip won’t wrap around the hook. Add on top the strands of pearl Flashabou and tie off neatly. Take a clump of deer hair and hold horizontally along the hook shank, take one turn of thread and let the hair flair, not spin, and do the same on the other side. Three or four wraps is enough to hold. Pull back the hair and tie off. 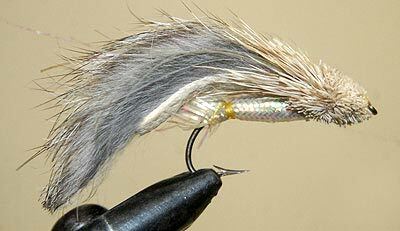 Take your scissors and trim to a flat bully shape rather than a ball shape as in the original Muddler Minnow. Step 4: Lastly shape the deer hair with fine scissors. Finally apply head cement to finish your Rabbit Muddler.